You're invited to attend the 4th annual “National Round Table Conference” to be held, March 13th through the 16thth of 2008. The CUE Center for Missing Persons will welcome people from across nation, attendees will be a mixture of families of the missing, organizations – advocates; including, private investigators, law officials, coroners, search and rescue groups and public agencies. The four-day event will focus on improving communication, learning about services offered, exchanging ideas and creating a unified support system for victims. The conference will also feature professional education/training, advocacy, investigation and exploring other aspects of missing person cases. One focus is to offer a place for those who suffer a missing loved one, to be empowered with knowledge; the conference promises all attendees to be informative, presenting new technology, offering ideas to make a difference in the way missing person cases are handled. Our mainstream goal is to provide resources and technique in locating the missing and or lost. We are approaching the 3rd year anniversary of Mark Degner & Bryan Hayes disappearance from Paxon Middle School. We will be hosting a Rally on Sunday, February 10th from 2pm-4pm for ALL missing in Jacksonville. The rally will be held in the open area next to Paxon High School. Please attend and show your support to the families. Please Join Austin's friends and family. 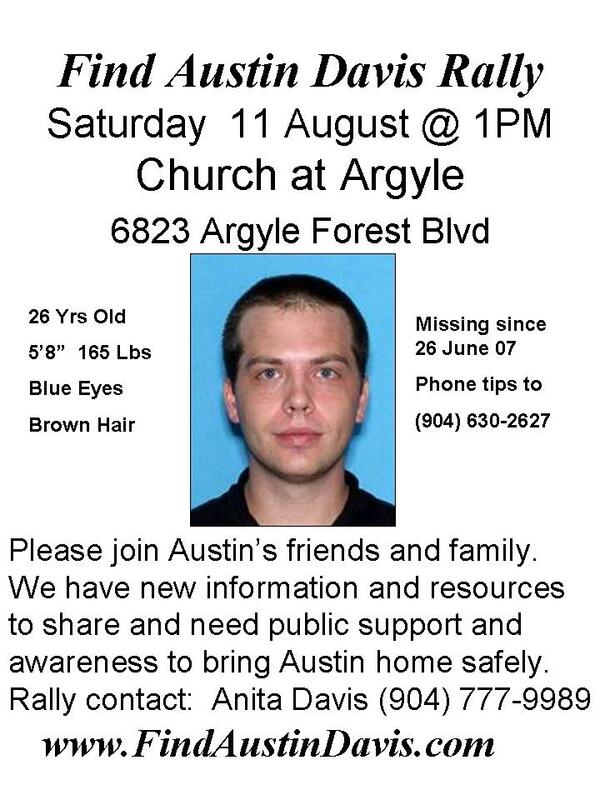 We have new information and resources to share and need public support and awareness to bring Austin home safely. Site Donated, Developed and Hosted by International Technical Industries, Inc.